Happy Friday!! Today, I wanted to share a few items that I have and love and also a few items that I've got on my wish list for Spring! I love finding any casual white top that I can throw on during the warmer months with ripped denim or denim shorts. This white top is perfect, and I adore the ruffle detailing on it! Secondly, I have and LOVE these round sunnies. They just came back in stock, and I have already ordered another pair of them in a different color! These Levi's are my current faves and such a staple for your closet! I have the lighter wash, but I love the contrast of the white top with the darker wash! Finally, these wedges and this crossbody bag are the perfect pairing! 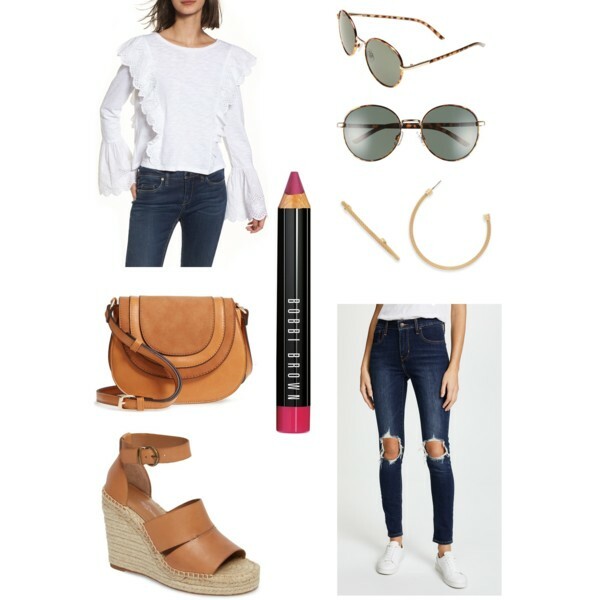 I'm linking a few other white tops I'm loving along with some other denim options in the widget below! Similar earrings here and more about this exact pair below! Horizontal Stripes + The Shopbop Sale!! I have always been afraid of wearing horizontal stripes, but when I spotted this top I thought it would make a great staple for my wardrobe. Pair it underneath a trench coat, tucked into denim shorts, with your favorite statement block heels and you've got an easy put together look! It is a little more fitted (I should have actually sized down), so it tucks in easily and is way more flattering than wearing a loose garment with horizontal stripes. What are your thoughts on the cropped denim trend? I'm loving it, but I'm also tall so it makes my life a little easier when jean shopping! Pairing cropped denim with a statement shoe makes such a difference though! I adore this pair!